When I first decided to quit my steady job of almost five years (sorry, mom and dad!) and move to South Korea to teach, all I could think about was the fun stuff. “Where will I travel?” “What delicious food will I eat?” “What events will I go to?” Yes, those questions still go through my mind pretty much every day, but you have to have some money to do all of that… you can’t totally blow it right when you arrive. Setting up a bank account: You can’t do anything until this is done! When you first arrive at your school, your co-teacher/someone in the school will take you to the bank to help you set up your account. 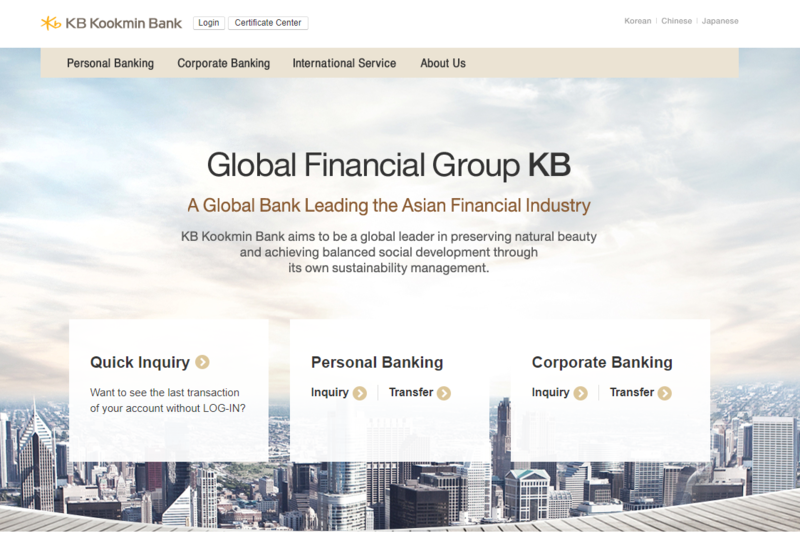 I recommend choosing either KEB Hana or KB Kookmin if you’re able, as those are the easiest to transfer money back to the U.S. You should set up your bank account with your school because they will pay you at the end of each month by direct deposit to this account. Bonus: Both of these banks have apps and online banking in English! And most banks will also have someone who speaks some English if you ever have problems in the future or need help. Rent: It’s free! In the U.S., rent is usually a huge portion of your salary, and you don’t have to worry about that here. All you have to do is pay for utilities, and they are so cheap. I only pay two bills: gas and electricity, and the two combined per month have never been higher than $10. Yeah, it’s pretty awesome. 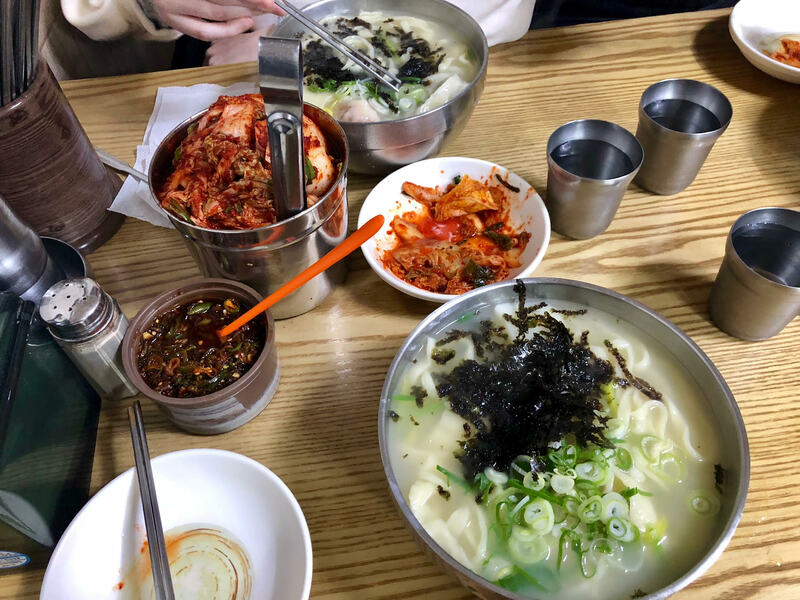 Food: Now, this was something I was very excited about when coming to South Korea--it has some amazing food! This is probably what I spend most of my money on. The average meal for me costs between $5 - $8. If I spend more than $10 on a meal (12,000+ Korean won), I feel like I’m spending too much. My school lunches are taken out of my paycheck, about $50 for the whole month (not too shabby). Plus, they are delicious--no rectangle pizza and sugary fruit cups here. Typical meal, costing about $5 USD. If you like to cook, that’s also an option. The kitchen in your apartment will likely be small (no oven, no microwave), but will have a small gas stove. You can definitely cook there--I do. There are markets and grocery stores everywhere, as well as convenient stores. At local markets, you can get a lot of fresh produce for low cost (think: a lot of fresh bok choy for about $2). You can also go to grocery stores just like at home, and find most of what you would want for cheap. The only thing you will have a hard time finding here are spices from home (if they have them, they will be VERY expensive) and peanut butter. I will never take peanut butter for granted again. Important note: you will have to buy bottled water when living here, or buy a water filter for your fridge. I was told this by friends before I left for Korea, as well as my colleagues at school and during orientation. Filters are a bit more expensive ($50+), and then you will need to buy the filters going forward (I am not sure exactly how much, as I didn’t do this -- I couldn’t fit one in my fridge). I order large bottles of water online and get it shipped to my apartment. 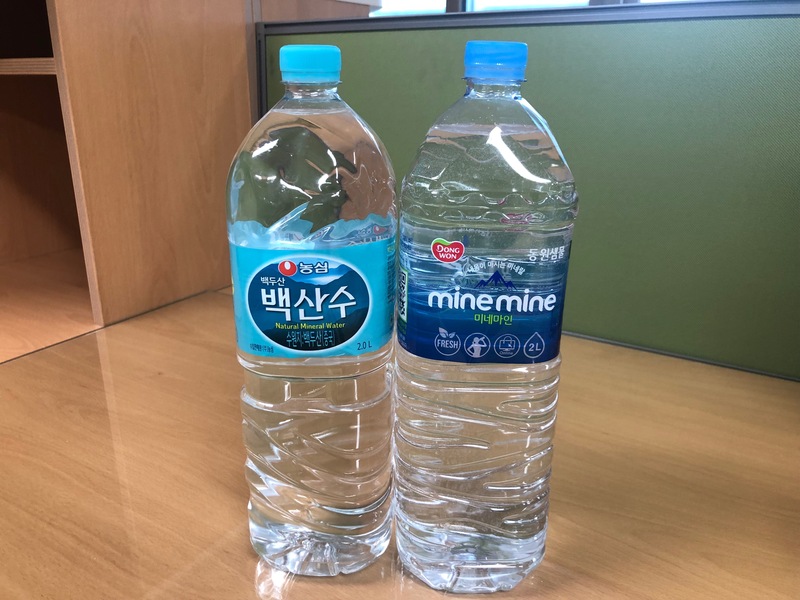 24, 2-liter bottles of water cost about $18, and last me about 2 months (I drink a lot of water). Your school will probably also have a water filter you can use. You can also buy water at any convenient store. PS: if you’re worried about how many plastic bottles you’ll be using, I’m with you. Not a fan. However, Korea has a really strong recycling program, and you have to separate all your recycling and put it into different bags. They are super strict about this, and you can get fined if you don’t do it! Seems scary, but gives me some peace of mind when using so many plastic bottles. 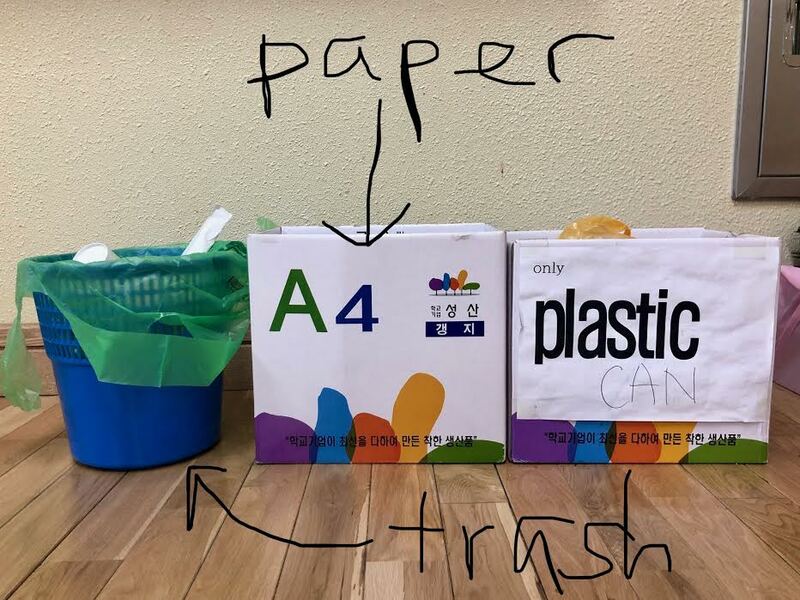 Small example of recycling -- this is at my school. You can also put your trash, recycling, etc. outside of your apartment and someone will pick it up for you. 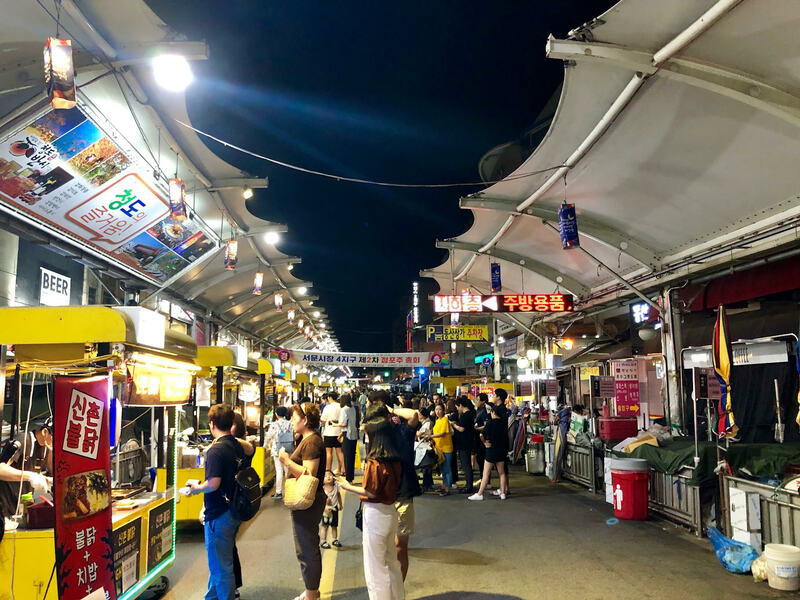 Transportation and travel: I live out in a more rural part of my province, Daegu, so have to take about a 40 minute trip any time I want to go into the main city. This is a bus ride and the subway, and costs about $1.40 one way. Your transportation card works for everything--the bus, subway and taxis. If you “tap out” when you leave one mode of transportation to transfer to another, it doesn’t charge you twice. On average, I probably spend $30/month on regular public transportation. This does not include any trains or busses to other cities on the weekends. 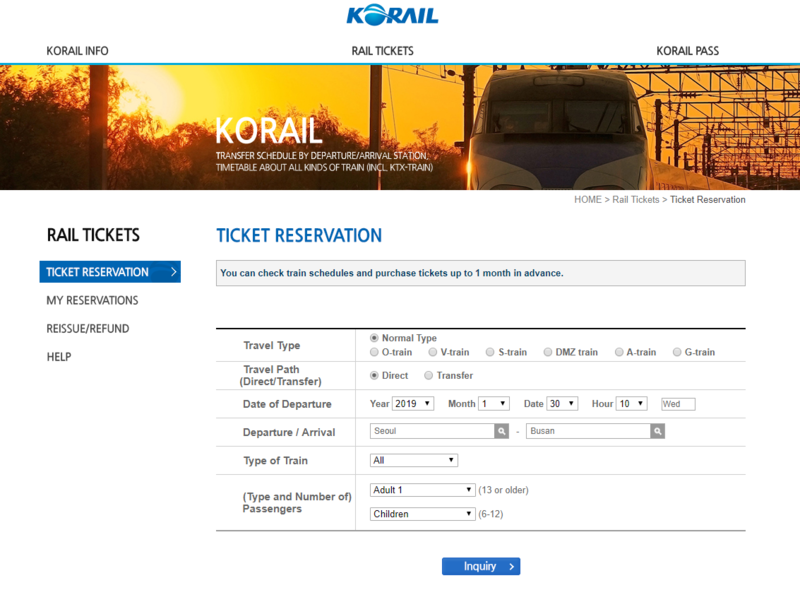 For example, a high-speed (KTX) train from Daegu to Seoul costs about $38 one way, taking less than 2 hours (amazing!). A bus from Daegu to Seoul costs about $10 and takes a little more than 3 hours. If you live closer to Seoul, it will cost less. Plus, the public transportation in Korea is the best I’ve ever seen! I’ve been in Korea for about 6 months, and I’ve traveled to six cities outside of Daegu, been on a 2-week winter break trip to Thailand and still have saved money. Since Korea is a small country, it’s easy and quick to get around to most places. If you travel, you’ll probably stay in an Airbnb or hotel. I prefer Airbnb, as they come with recommendations from the hosts! It’s a great way to see the city you’re visiting. So far, I’ve found an average night in an Airbnb for 2-3 people is around $70/night, but you can certainly find some for more or less. So, that makes it only $23ish if you go with friends. Too long, didn’t read: Rent is free. Food is cheap and delicious. Traveling around the country is so easy, and not that expensive. You will save money while you live here, probably without even trying! Unless you are flying off to some new country every weekend--and if you do that, I don’t blame you. This part of the world is incredible! Topic Tags: TEFL, Food, Daily Life, Tips & Advice, Why Teach Abroad?